Precision Controls - Authorised distributor of Governors, Protection Relays, Generator Controls and other engineering solutions. Precision Controls Ltd (PCL) has been providing solutions to the industrial and marine engine and power generation markets for over 25 years. Offering full support of product sales, PCL provide technical back-up, installations, retrofit solutions, commissioning, service/repair, site survey, and a training programme either in-house or on-site. G59 on-site testing also now available. For further information please feel free to browse our website or contact the head office in Stockport for further assistance. We are pleased to have achieved 25 years of service to the engine and engine gen-set market. We appreciate all the years of customer support and we continue to provide sales and service always offering the latest products of our represented companies. PCL HAVE MOVED! 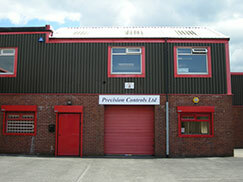 We will now be located at Unit 4 Hillgate Business Centre, Stockport, SK1 3AU. PCL celebrates its 20th anniversary within the Power Generation industry! PCL continue to supply TDI air starters for an ongoing marine application to a well known engine manufacturer.